Avalon Freight Services is a company that combines the maritime expertise and renown of Harley Franco of Harley Marine Services and Greg Bombard of Catalina Express, coupled with similar core values and principles of quality, integrity, respect for the environment and safety. Harley Marine is a full service maritime company operating with a strategic focus on safety and environmental sustainability. As the company continues to grow at a rapid pace, Harley Marine ensures they are always operating at the highest, most efficient, and safest possible level. Harley Marine has received dozens of awards for its philanthropic activities, environmental standards, safety record and corporate leadership. 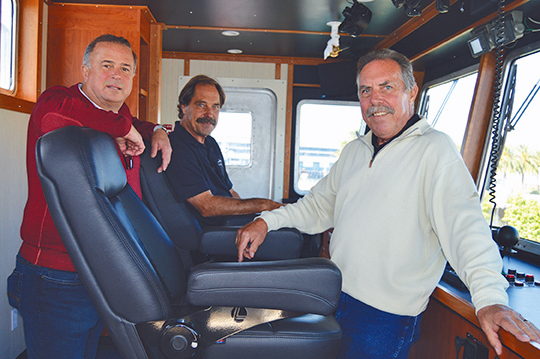 Three generations of the Bombard family, including Al, Doug, Greg and Tim, have been welcoming Catalina Island visitors on board their boats for nearly a century. Al Bombard, Doug’s father and Greg’s grandfather, established the Catalina Speedboat Company in 1922, using World War I aircraft engines in his speedboats. The boats, which he called Miss Catalinas, were attractions in their own right for visitors to the island. Doug Bombard grew up working on and piloting the Miss Catalina speedboats, plying the Avalon and Two Harbors areas, the harbor and surrounding coves. In 1981, founders Doug Bombard, with son Greg and colleague Tom Rutter, formed Catalina Express with one 60-passenger vessel carrying 3,256 passengers, seven employees, and three scheduled round-trips per day between San Pedro and the Catalina Island ports of Avalon and Two Harbors. Currently, its fleet of eight high-speed vessels carries more than 1 million passengers per year and each year anticipates 9,500 channel crossings. 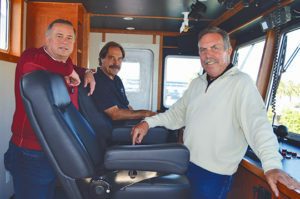 Since its first year in business, more than 25 million passengers have traveled aboard Catalina Express-operated boats. The company is the only service to operate daily service throughout the year.